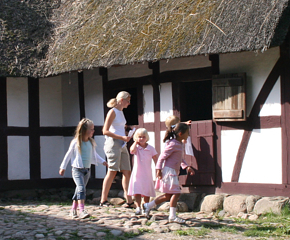 Meet and soak up Danish Cultural History through generations. The blacksmiths house from the isle of Funen from 1845. At the back of the house is a little building for pigs and chicken. Attached to the building is also the blacksmiths workshop. The Open Air Museum Called - Frilandsmuseet - was founded in 1897 - by Bernhard Olsen - an enthusiastic museums inspector - who found it appropriate for coming generations to experience old buildings and created the Danish Peoples Museum for preservation of rural houses and homes from the past - and also to protect Danish culture and heritage that seemed to be lost for ever. His museum was then integrated into the Open Air Museum (Frilandsmuseet) and moved to its present location in 1901 - to the northern outskirts of Copenhagen at Kongens Lyngby. Farmhouse from south Jutland from around 1700 with its authentically furniture and garden. 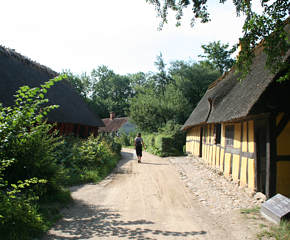 Most of the rural farming residents at the museum are fine half-timbered houses with thatched roofs. The shoemaker’s workshop with all the necessary tools from around 1885. Workshops were always a part of the resident - as well as the stables for the animal husbandry - and the living quarters were placed just beside. Today - the Open Air Museums is one of oldest and largest in the world and is spread over 86 acres of land with more than 100 farmhouses - countrified homes - rural buildings - mills etc. from the period 1650 to 1950. All the buildings have painstakingly brick by brick been recreated and placed watchfully over this very picturesque area at Kongens Lyngby and offers the visitors to take a stroll back into Danish history and culture for many centuries. 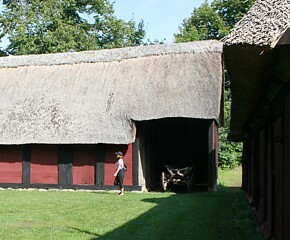 Most of the rural farming residents at the museum are fine half-timbered houses with thatched roofs that and appears as in the 18th and 19th century and was the time when famous storyteller and writer Hans Christian Andersen lived as well as philosopher and theologian Søren A. Kierkegaard. The total inhabitants at that time in Denmark were nearly 1. million people and the first Constitutional Act of Denmark was signed by King Frederik VII in 1849. Visitors will find themselves in natural historic scenery - when strolling through the museums old farmhouses. Both buildings on the left and right are built around 1700 and full furnished. The museum is a very popular venue and attracts tourists and visitor of all ages. Especially families and pupils from schools and kinder gardens are regular visitors at these historical premises. All of the ancient buildings exhibited at the museum premises were carefully transferred from their originally site to the museum area and are fully furnished and equipped with the genuine furniture - tools - kitchen utensils - household items and textiles. The existing land of each building has been made into the original gardens or reshaped in order to show the diverse character of the surrounding area in the various parts of the country with running streams - open landscapes or stretches of unfruitful heath. Visitors can experience old country gardens in their original set up and the museums many animals like horses - cattle - pigs - ducks - chickens - goats and sheep - which also contributes to create interest and fun for the younger visitors. The museum offer many types of activities and also an exciting house buggy ride around the entire rural areas and countryside. Folk dancers performing for the public at the museum with their traditional costumes - often originated from their region. 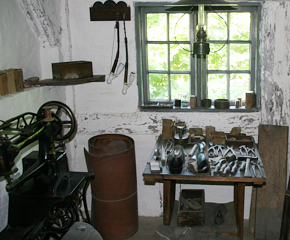 Many of the old farmhouses have workshops attached to the premises - were the visitor can experience different types of handicraft items and tools are displayed. 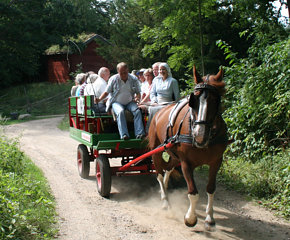 Many activities are conducted at the Open Air Museum and one can take the horse buggy and see the entire premises of the museum. 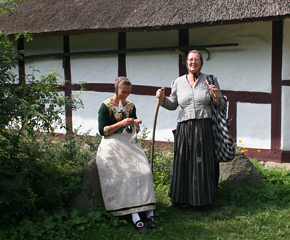 Visitors can even bump into people dressed in their national costumes or everyday clothing as well as a peasant - miller - blacksmith - shoemaker - housewife from the past - who all will greet and welcome you to the museum. There are picnic facilities at the museum - but one can also find some charming settings for a picnic surrounded by ancient residents - half-timbered thatched houses or at historical gardens or flourishing backyards from the very past. Two housewife’s from the 19th century in their national clothes welcoming the museum's guests. 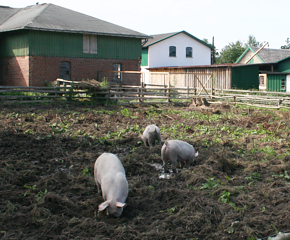 At the backyard of an old farm - pigs are enjoying their daily meal in natural surroundings. 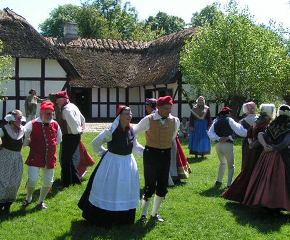 Any tourist visiting Copenhagen -the Open Air Museum at Kongens Lyngby is a must for every sightseer that wants to spend a day in historical surroundings and to learn more about Danish history and culture plus the every day life in Denmark many centuries ago. 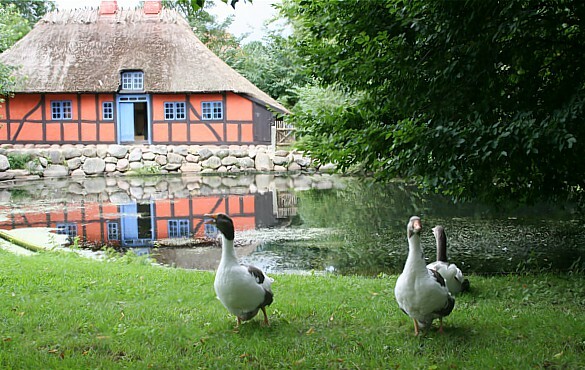 The open Air Museum (Frilandsmuseet) is located at Kongens Lyngby north of Copenhagen and almost 16 km from the city centre.